HOUSTON (KTRK) -- The entire city of Houston will be abuzz next week as Super Bowl 51 rolls into town, and the Galleria is no exception. Will NRG plays host to the nation's elite football players, the state's biggest mall will play host to a long list of exciting events and promotions to surprise and delight locals and tourists alike. The Super Bowl Recharge Lounge, on the second level of the newly completed Galleria VI, will offer shoppers a respite from football craziness. Luxe seating, cellphone chargers and refreshments will be offered Monday, Jan. 30th through Saturday, Feb. 4th from 12-7pm and Sunday, Feb. 5 from 11am-6pm. 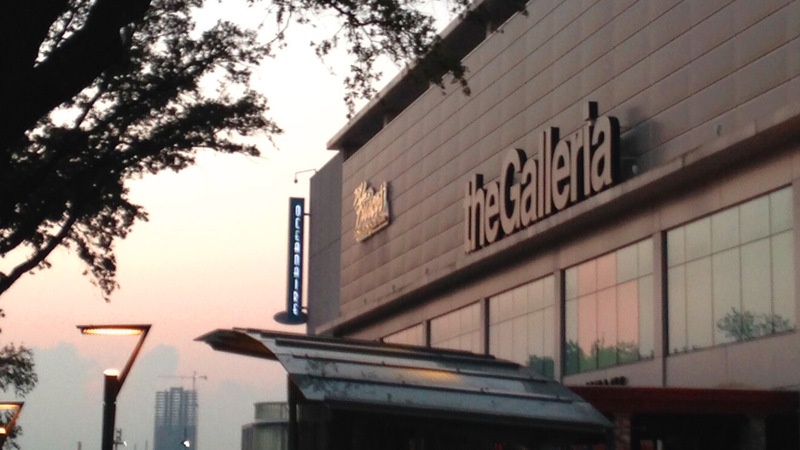 The Galleria and Houston Premium Outlets are also offering shuttle service between both malls and the Downtown Visitor Center between Jan. 28 and Feb. 4. The shuttle costs $20 per person round-trip, and reservations can be made by visiting hgstravel.com/reservations or calling 713-722-0395. A METRO shuttle will also run every 15 minutes between The Galleria, the Hilton Houston Post Oak and Downtown from Feb. 1st through Feb. 5th (the pink route), and from The Galleria, Hilton Houston Post Oak and NRG Park on Feb. 5th from 11am until midnight on the blue route). METRO service will cost $2 per person in each direction. Click here for more information about METRO service during Super Bowl week. Enjoy complimentary wine and soft drinks at this luxury jewelry mecca. Located on Level 2, near Galleria Financial Center elevators. Dance, shop and sip! There will be a DJ and refreshments at this classic retailer of modern American style. Located on Level 1 & 2 in Galleria IV, Nordstrom Wing. Super Bowl, Super You! Enjoy a mini-facial with your make-under at this trusted source for natural beauty products. Located on Level 1, near Galleria Financial Center elevators. Sip on refreshments will discovering the venerable British brand's latest collection. If you're visiting Houston for the Manchester Derby, you're in for a culinary adventure. The Bayou City is known for its vibrant food scene, and restaurants offer nearly every kind of cuisine imaginable. Discover the luxury menswear brand's Spring Summer 2017 collection, featuring limited edition Made to Measure fabrics, only available during Super Bowl week. Hotel or Office fittings can also be accommodated through Ermenegildo Zegna At Your Service. Located on Level 1 in Galleria I, near Neiman Marcus. Spin the wheel for a chance to win up to 20% off your entire purchase at this trendy girls' apparel and accessories store. Located in Galleria I, Level 2 near Neiman Marcus. Stop by this iconic New York-based accessory shop for their Bendel Break party with special savings and a Super Bowl themed treat. Located on Level 2, near Saks Fifth Avenue. View exclusive pieces from the British high fashion house's Men's Collection, only available during Super Bowl week. Located on Level 1, near Neiman Marcus. Get your game face on with a complimentary mini-facial, eye refresher or hand massage. Located on Level 2, near Galleria Financial Center elevators. Visit the global accessories brand's boutique by February 3 and enter to win a pair of tickets to the Maxim Big Game Party. Located on Level 1 in Galleria I, near Neiman Marcus. Learn from Macy's Culinary Council Chef, Bryan Caswell, as he shares stories, best kept culinary secrets and techniques on how to prepare some of his favorite award-winning dishes that any team would love. Receive a special game day gift, meet the chef and take a photo with him with your qualifying purchase. Located in Macy's Pop Up Kitchen on Level 2 (January 28, 3 p.m.). Change your nail polish to your favorite team's color at the Nail-Gating station, where glamour meets the gridiron in Macy's End-Zone on Level 1 (February 4, 2 p.m.). Round up the family and enjoy an afternoon of face painting, crafts, games and more! Plus, shoppers will take home a special football-themed gift with a qualifying kid purchase. Located in Macy's Kid's Department on Level 3 (February 4, 2 p.m.). Cocktails and Conversations. Enjoy complimentary cocktails and light bites at this internationally acclaimed men's footwear and accessories retailer. Plus, register to win an authentic football helmet of your choice from The Patriots or The Ravens. Located on Level 1 in Galleria I. A live DJ will be spinning tunes in the men's accessories department while shoppers browse Frigo's revolutionary undergarments. Enjoy refreshments and a live DJ at this luxury eye wear destination's Super Bowl tailgate party. Located on Level 1, near Galleria VI. Come and get Super Bowl ready at Origins with an express mini facial and makeup application! Book your in-store party by calling 713.622.6363. Located on Level 2 in Galleria II, near the Westin Galleria Hotel. Join current and retired NFL players to kick off the Super Bowl weekend at this popular South African restaurant. Hosted by Emmy, SAG and Golden Globe award winner Anthony Anderson, with former Tampa Bay Buccaneer John McLaughlin spinning. $25 general admission, $80 VIP admission. Located on Level 1 in Galleria II. Take an on-demand, 60-minute pregame ride with Jenn Sherman and enjoy refreshments and snacks to get you pumped for the Super Bowl! Located on Level 1 in Galleria IV, Nordstrom Wing. Meet Christian Covington, defensive end for the Houston Texans and stock up on sports apparel for the big game. Located on Level 2 in Galleria II. Enjoy complimentary makeup sessions with tips on how to highlight and contour for the big game. Located on Level 2 in Galleria I. Celebrate with a viewing of The George S. Halas Trophy, The Lamar Hunt Trophy and the Pete Rozelle Super Bowl MVP Trophy, handcrafted by Tiffany & Co.
Get game day ready with a DJ in-store and free embroidery on purchases over $100. Located on Level 1 & 2 in Galleria II.